Howie Rook does not care for the police. After a long career in newspapers, he has seen too many cases loused up by unimaginative detectives to have any faith in by-the-book investigation. Recently retired, he spends his leisure hours writing letters to the editor regarding police stupidity. He’s so good at pointing out the department’s screw-ups that it has decided to reach out to him. They have an impossible crime, and it requires an amateur’s eye. Real estate magnate James McFarley is found dead in a locked room, a bullet in his chest, and clown make-up on his face. The police have no suspects, no witnesses, and no hope but Rook. The amateur’s skill is about to be put to the test. Will he find the killer, or will he end up looking sillier than a murdered clown? 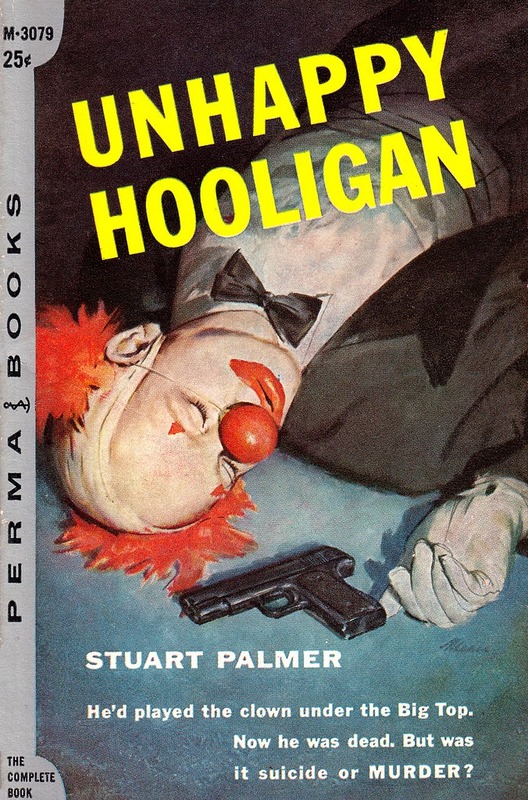 I haven’t read Unhappy Hooligan (which should of course not be confused with Stuart Palmer’s 1941 Hildegarde Withers whodunit, The Puzzle of the Happy Hooligan), but Grost notes that it’s “a full-fledged locked-room mystery” with “a fair, plausible solution.” At the same time, he derides the book as rather dull, “full of the fashionable Freudianism of the fifties, and contain[ing] some nasty Freudian homophobia--something which returns, briefly, in Rook Takes Knight.” I’d welcome comments below from anyone else who has read those two Howie Rook novels. 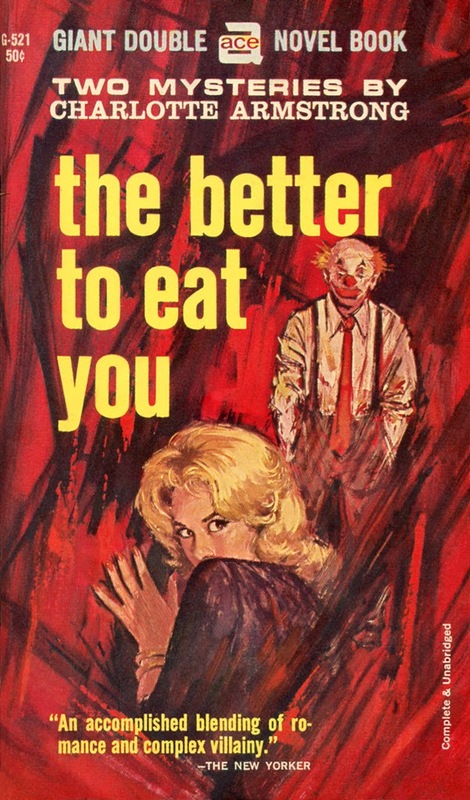 The Better to Eat You is a standalone novel, which was first published in 1954 (and sometimes appears under the less interesting title Murder’s Nest). A review of the book, posted in Australia’s Sydney Morning Herald on December 6, 1954, described it as a “comparatively unhorrifying tale of a young college professor who falls in love with a girl whose friends have a habit of dying. She believes that he is under a curse. He does not. When his car slips down the street and kills a woman, he knows there is something human behind it all. “Something human” turns out to be a wily ex-clown with as many twists as a snake. We know why almost right from the start, but arson, poisoned brandy, and wires on cliff paths keep up the interest all the way to the slight gooey end. Ace Books’ 1963 paperback version of The Better to Eat You was paired in a single volume with another Armstrong suspenser, Mischief (1951). Sadly, I hear, the artist is not identified in the book, nor is there a credit to be found on the Web. Like Palmer’s Unhappy Hooligan, both The Better to Eat You and Mischief are available as e-books from publisher Mysterious Press/Open Road.